Last month I published my first book Animal Stars: Behind the Scenes with Your Favorite Animal Actors, co-written with my friends Allen and Linda Anderson, and featuring a foreword from America’s Veterinarian, Dr. Marty Becker. I approached the book with a fan’s mentality: I was raised on Disney movies and iconic television shows like “Lassie,” “Mr. Ed,” and “Flipper.” Those animal stars are some of the most iconic in Hollywood history, and I was so honored to learn that American Humane Association’s “No Animals Were Harmed®” Program was there on set then to make sure those stars were safe when bringing their larger than life roles to the silver and small screen. This book is a love letter to not only those amazing animal actors, but their hardworking, dedicated trainers as well. My goal with the book was to show readers how much hard work and long hours it takes to make these roles a reality, and the amount of effort our own Certified Animal Safety Representatives™ go through to truly ensure the safety of those furry, winged, and scaled actors. 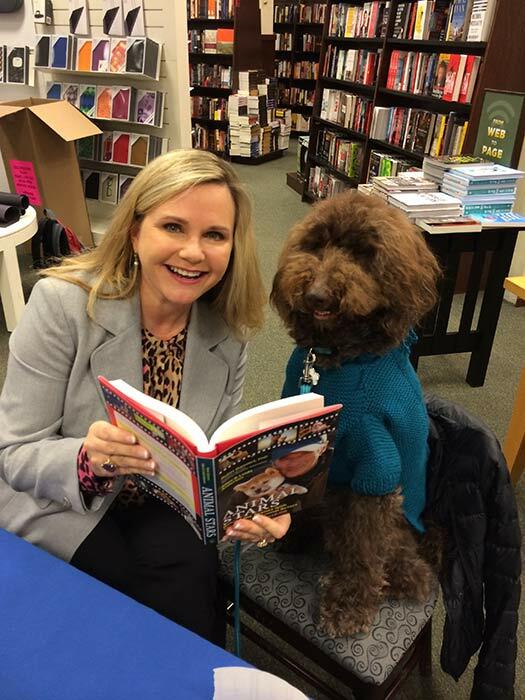 Now that the hardcover edition (featuring Richard Gere and Chico the Akita, the titular canine star of Hachi) is in bookstores everywhere, I’ve been on the road at Barnes & Nobles around the country to meet people like me: lifelong fans of animal actors. We’ve had some great stops along the way, and have many touching experiences we’ll cherish for a lifetime.